Over the past couple of months we have been asked about our workshop and what it has to do with printed circuit boards (PCB) well we’re here to tell you. 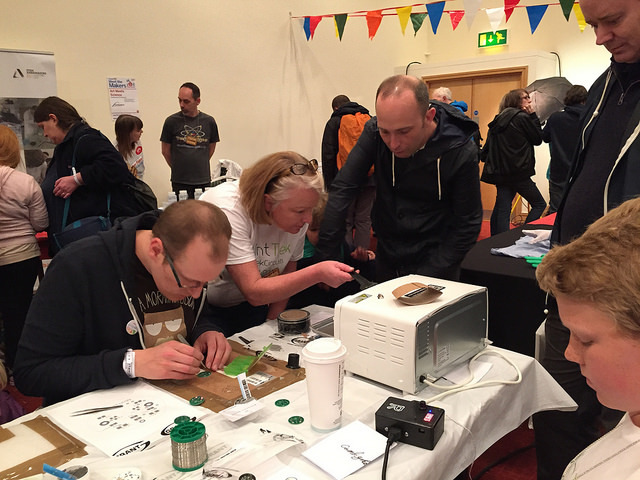 Both In the UK and Ireland we have attended events and ran workshops where people can manufacture a small PCB badge with our help. 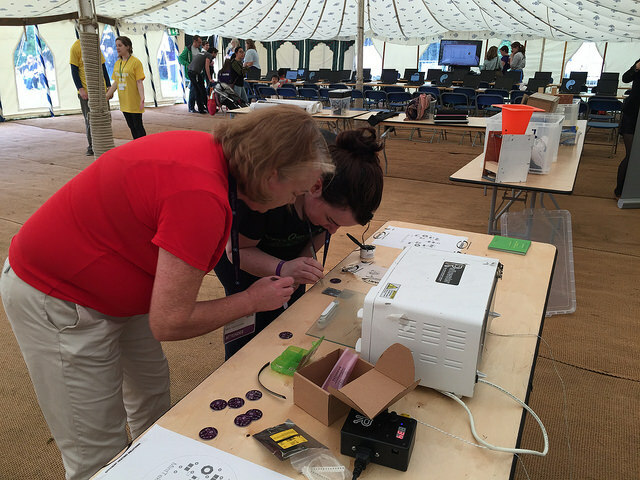 These PCB boards are generally green but can be changed for different events e.g our PCB printed circuit boards used for the badges during InspireFest was purple. The PCB layout can also be changed from a circular disk like shape to a more relevant PCB, we get our PCB manufacture to supply our printed circuit boards after we give them the PCB design. We buy in the components and all the necessary materials to make the flashing led circuit board badges. In order to make our badge we place a stencil on our printed circuit board and line the empty spaces up to where the components will be positioned then we spread the soldering paste across this stencil in order to have the paste on the area where the components will be held, this is to ensure the components will stay on the PCB board and to provide connectivity and conductivity to the components later on in this cycle. Next we use the tweezers to pick up the components and place on the board as is needed. Then we stick the badge/ pcb into the reflowster oven making sure to set temperature as is needed and wait for the reflow to do its work. 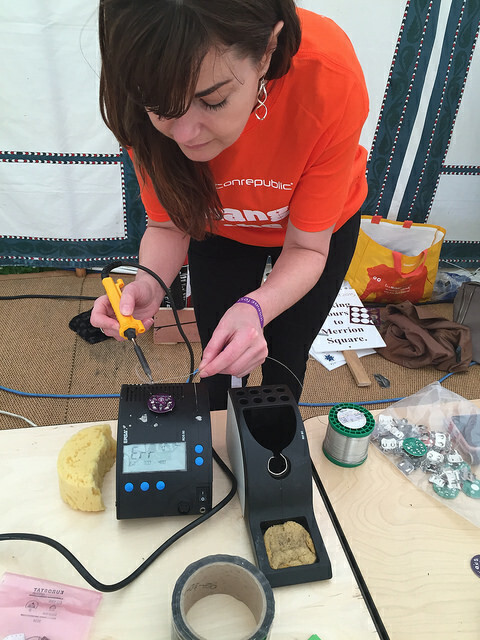 Then we take it out of the oven ensuring the soldering paste has now turned silver which shows its conductivity and then we test it using a battery. If it’s a success we then solder the back on to hold the battery in place and insert a pin to make it a badge. The reason we do this is to show people our printed circuit boards and that they too could make a pcb prototype in the future if so, we do hope they avail of our PCB services. Mint Tek Circuits are a proud source of Printed Circuit Boards Ireland And Printed Circuit Boards UK. 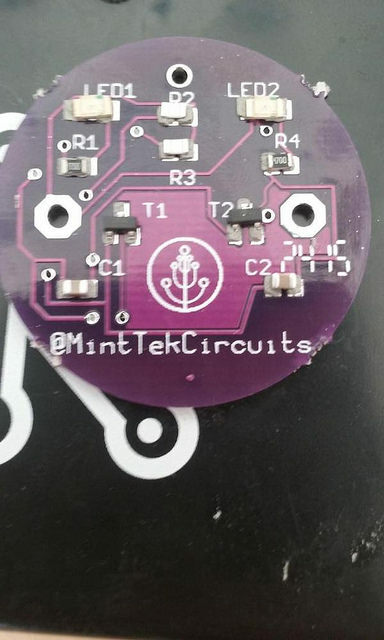 Mint Tek Circuits seeks to be recognised as the go-to website for hardware developers to source their printed circuit boards and create their prototypes. Our niche market is hardware developers who want to source prototype volumes to demonstrate their idea in advance of manufacture. 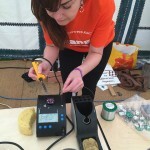 Mint Tek was founded by Georgina Kearney and Siobhán ní Chofaigh.